Wiki Wins Casino will then reward you with a bonus (Welcome Bonus is for new players only). The terms and conditions of the bonuses vary between different casinos and might also change over time and between different countries, so it is important to compare the different offers and read the T&C for Wiki Wins Casino before signing up. 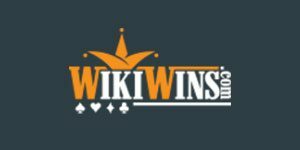 If you know “wiki” in Hawaiian stands for “fast”, you’ll understand WikiWins casino is the place to go for quick wins – or at least that’s what the operator is aiming to make it. WikiWins is a Curacao-licensed online casino owned and operated by QuotaPartners, the same company responsible for Casino Cerise; if you’ve ever played at the latter, a visit to WikiWins will feel like coming home. The site was launched in 2014 and thus had enough time to stock its gaming catalogue with as many as 700+ casino games powered by Microgaming and several other developers. New members are recruited with the help of a generous 250% welcome bonus up to €500, Daily Lotteries pay hefty rewards, and Comp Points exchangeable for free credits are the Casino’s way to reward loyal members. This instant-play casino provides games by Microgaming, iSoftBet, Playson, Pariplay and Spinomenal, along with rarely seen Betixon, Booongo, EvoPlay and Playstar. “Play for fun” button allows players to practice for free until confident enough to start wagering real cash. Shrinkage caused by moving to smaller screens of iOS and Android mobile devices is not a severe as elsewhere, allowing players on the move to access more than 500 titles. As expected, a good portion of slots was provided by one of the industry top suppliers, Microgaming. Using the appropriate filter makes it easy to find big hits such as Thunderstruck II, Game of Thrones, Terminator 2, Girls With Guns and Lost Vegas, as well as classic slots like Couch Potato, Break Da Bank and Cool Buck. Going through Microgaming assortment, one will stumble upon a few popular ones provided by NextGen, namely Foxin’ Wins, Merlin’s Millions, Medusa and Mad Mad Monkey. The newest releases are, however, missing, indicating the Casino is not so concerned about keeping its library updated. Still, this is a good opportunity to try titles one is unlikely to find elsewhere, such as Spinomenal’s Iron Assassin, Booongo’s Kailash Mystery, and Battle Tanks from EvoPlay. Having launched the first, the player will see a target moving to the next location with each spin; should any Wilds fall onto the target, they’ll trigger a unique Wild feature – Sticky Wilds with re-spins, Wild multiplier, or Wild generator which transforms regular symbols into substitutes. Same happens during free games, the difference being that a new target is added after each consecutive spin. An engaging bonus round tasks the player with shooting at aliens to eliminate their invasion. Kailash Mystery features a unique reel area in the shape of a circle; Scatters trigger free games with expanding Wilds and Spinning Reel which changes the route of bet lines to generate more winnings. Battle Tanks is a visually impressive video slots in which Scatters activate Free Spins with tripled payouts, and Bonus game has the player shooting at enemy tanks to collect instant wins. WikiWins’ collection of table games counts close to 50 products, and though heavily focused on Blackjack, it also contains European, French, American, Multi Wheel and Bonus Roulette, Baccarat, Punto Banco, Stud Poker, Casino Hold ‘Em, and Casino High Low. If none of the above meets the player’s needs, they’re welcome to check the selection of about dozen Video Poker games and play the likes of Wild Sevens, Poker Pursuit, 10x Play, Joker Poker Big Beer and Joker Wheel Bonus, or one of the more common variants such as Jacks Or Better or All Aces. Scratch Cards section offers further alternatives, among which a solitary Bingo game. Several other Bingo and Keno games can be found scattered elsewhere. Though we’ve seen a mention of Live Casino somewhere on the site, corresponding tab was nowhere to be found. Contact with a customer support agent confirms – no live dealer games can be played at WikiWins. The Casino accepts payments in EUR, USD, GBP, AUD, CAD, ZAR, DKK, NOK, SEK and BTC. Players can deposit a minimum of €20 via credit and debit cards (Visa, MasterCard), Neteller, Neosurf, CASHlib, PaySafeCard, UPayCard or Bitcoin. Withdrawals made with Visa, Neteller, Bitcoin or Bank Transfer all come with a €100 minimum limit. The maximum amount WikiWins is willing to pay depends on one’s VIP status and ranges between €740 and €5,000 per week. The operator will take 48 to 72 hours to process cash-out requests. Browsing through the provided FAQ list is always a good place to start, though the one available at WikiWins website leaves a lot of questions unanswered. Chances are new players will need to speak with the operator very early on, and they can do so by using Support tab permanently positioned in the bottom right corner. It opens a simple contact form that needs to be filled in and sent, after which a support agent promptly gets in touch.